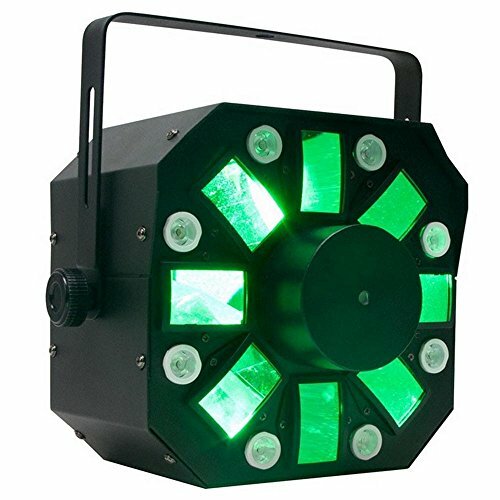 The American DJ Stinger offers 3 FX-in-1 and utilizes 3 light sources - 6, 5-watt hex-LEDs, 8, 3-watt white LEDs and a red and green laser - to give users a moonflower/strobe/laser combo effect that creates new levels of pure lighting excitement for audiences. The American DJ Stinger is lightweight so on-the-go DJs, DIY touring bands, and event organizers can take it on the road as part of their mobile setup, giving them a compact but powerful effect. Get more out of your lighting system with the American DJ Stinger DMX Laser, Strobe and Moonflower LED Light Effect.